He was the first and only President to marry while in the White House, and his wife, Frances Folsom was the youngest first lady ever at age 21. The daughter of his late Buffalo law partner, they eventually had 5 children, 3 of which were born during Cleveland’s two terms. In his first term as President (1885-1889), Grover Cleveland received the Statue of Liberty as a gift from France and oversaw the fall of Geronimo’s Apache bands, ending the Apache wars and cementing American expansion. Foreign policy-wise, Cleveland warned against the imperialistic tendencies of the Gilded Age and opposed Hawaiian annexation. Cleveland took great lengths to ban special economic favors and fight corruption during his first term; he vetoed bills to extend fraudulent pension benefits for Civil War veterans. He also signed the Interstate Commerce Act, the first piece of legislation to regulate railroads. An ardent defender of free trade, he would fight against Republican protectionists in Congress who sought to support industry with high tariffs. Unfortunately, this in conjunction with the notorious Murchison letter cost him the 1888 election to Benjamin Harrison of Indiana. Irish-Americans saw his free trade philosophy and the British ambassador to the United States’ tacit support as sacrilegious pro-Britain stances. After losing to Benjamin Harrison in 1888, the passage of the protectionist McKinley Tariff thrust Grover Cleveland back into power in 1892. Unfortunately, his second term got off to a rocky start after the Panic of 1893. He repealed the inflation-causing Sherman Silver Purchase Act and maintained the Treasury’s gold reserve as a backing for currency. He also sent federal troops to enforce an injunction when Chicago railroad workers went on strike. His bluntness also came through when he enforced the Monroe Doctrine and forced Great Britain to accept an arbitration of a disputed boundary in Venezuela. After leaving the White House Cleveland retired to Princeton where he frequented Princeton University, speaking at Alexander Hall as part of a public lectureship while presiding at debates and campus meetings. He often lectured on the Venezuelan boundary controversy with Britain, the independence of the presidency, and the role of government in the Pullman strike in Chicago. In 1901 he became a trustee of Princeton University and spoke at the dedication of the Faculty Room at Nassau Hall in 1906. Grover Cleveland’s son, Richard, enrolled at Princeton in 1919 and became a center on the championship football team during his 4 years at the University. He lived in his large house in Princeton, Westland Manor, and was active in the university, despite his declining health. Every year, delegates from Hawaii come to Princeton to lay a traditional Hawaiian wreath on his tomb, recognizing his decision not to annex the islands almost 100 years after his death. Cleveland is not one of the most widely known presidents but his impact on the nation, and more locally our town, was significant. Cleveland prefaced the emergence of a new era in the presidency known as the “modern presidency” that started with Theodore Roosevelt. His lack of college education was largely unique among other presidents. This deficit in formal education left Cleveland unfamiliar with the historic role of the president as such he created his own ideas on the presidency and never developed a national ideological direction during his presidency. He saw it as enough to be hardworking, honest, and independent. 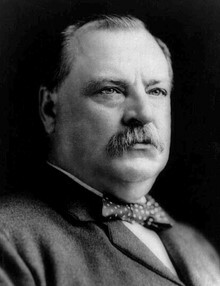 Despite his troubles, Cleveland was able to create a strong Democratic south by showing them they had a friend in the government. He also strengthened the party by linking the party to civil service reform. Locally, Cleveland was one of the town’s most distinguished figures. Besides his evident work in the University his presence alone in Princeton served to inspire all of the townspeople. When word of his death finally reached the citizens of Princeton activity in the town came to a halt and the profound impact Cleveland had on Princeton became evident.